Bradley Pontecore studied film and graduated from Columbia College in 1997, went on to study film production at the American Film Institute Conservatory and has wanted to make a feature film his entire life. But like many aspiring filmmakers, obstacles got in the way that required him to work a “day job,” which for him was in advertising. But all along, he kept his hopes alive and stayed active, making several music videos and short films, one even ending up at The Sundance Film Fest. Eventually, his passion led him to lay it all on the line and leave the advertising industry to work on a dream — his first feature, which will be released July 13. 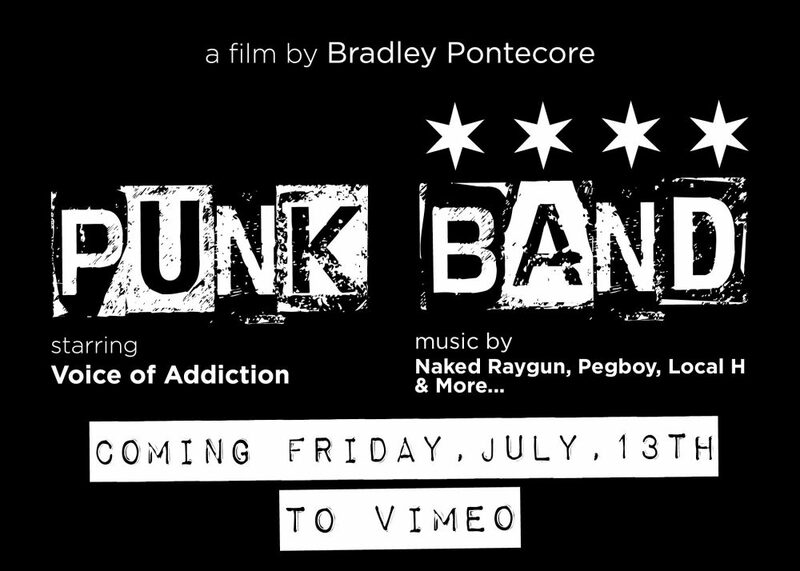 Pontecore’s film, simply entitled “Punk Band,” focuses on the Chicago punk rock outfit Voice of Addiction, but he’s quick to say that it’s not a documentary on the band. Nor a documentary on the Chicago punk scene. Instead, it’s more of a look at every struggling band that packs their gear into a van and hits the road for weeks at a time to play dive bars patronized by only a handful of people at times. It’s a look at real life on the road and a look at the three members of Voice of Addiction: founding member and elder statesman and curmudgeon Ian Tomele; quiet, diplomatic Jakob Smith; and the young wild youngster, 24-year-old Vinnie Dinwiddie. 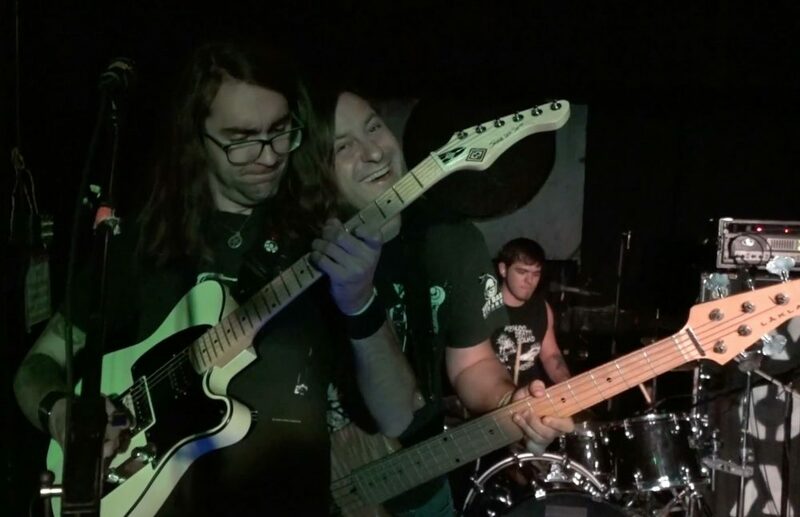 Punk Band takes us on the road and is an unscripted look at what happens when three vastly different personalities are together 24 hours, 7-days a week for six weeks during the band’s tour last year. And while music is a passion for the guys in Voice of Addiction (none of them have any desire for mainstream stardom), the film has been Pontecore’s passion for the last few years. He even moved out of Chicago and sold his truck, putting most of his money into his project that will at long last come in a couple of weeks. The Chicago Ambassador’s Bob Chiarito recently spoke to Pontecore about his passion project and what he anticipates the reaction will be. CA) Your film is as you’ve said, not a documentary on Voice of Addiction or a film about the Chicago punk scene. It seems to me that’s it’s the story of hundreds of bands, just jumping in a van and heading out to play dingy clubs because they love it. PONTECORE) That’s what I wanted to do. I wanted it to be a simple story with some political stuff coming from the band. I really just wanted to tell a road movie. CA) I think you’ve accomplished that. The guys have three distinct personalities and Jacob was really interesting. He was in the middle, trying to navigate between Ian and Vinnie. PONTECORE) Yeah, I even got to the point that I separated their personalities by having different sounds in the scenes where each of them was interviewed. For example, when Ian is interviewed, the sound was more street sounds and construction. For Vinnie, it was kids playing in the background. CA) How long did you work on the film? CA) Why make a film on Voice of Addiction? PONTECORE) I wanted to show what small-band touring was like. Not big-band touring, everyone already knows that and no one needs to see rich people hanging out. I wanted to show what it felt like to actually be on a tour that may not align with what you think rock and roll is like. If a big band came to me wanting me to film something I probably wouldn’t turn it down at this point, but my real goal was to tell this story. It wasn’t to fluff a band. CA) How long have you known the band? PONTECORE) I’ve known Ian for about 13 or 14 years and have seen all the different variations of Voice of Addiction. CA) There’s one scene in the movie when he mentions how many different drummers and guitarists that he’s gone through. CA) Do you think that may is a reflection of Ian? Of how hard it may be to get along with him? PONTECORE) I think so. I definitely think so. I don’t know if it’s something that I’d say to his face, but that’s basically what the movie is. Put three guys in a van and see what happens. There’s a lot of things going wrong with that band on the road. It has as much to do with the leader of that band as it does with its 24-year-old drummer with a mental problem. CA) Vinnie does come off like a baby or very immature at times in the movie, but is it safe to say that it’s not one person’s fault? PONTECORE) It really isn’t any one person’s fault. It’s really the story of putting people in a closed environment on the road for a long period of time and what takes place because of that. I just got lucky in that certain things took place while making the movie. CA) Obviously you did not know what would happen going into it, right? PONTECORE) No, I did not. CA) So the more drama that took place between them, the better it was for you? PONTECORE) Yes, for sure. Movies are based on conflict so whatever causes the conflict pushes the movie. That’s what I was going for. CA) When you approached them about doing the film, did they have any resistance or concerns? PONTECORE) Actually, no. They were pretty stoked about it. I spent some time filming them before they started their tour and it only took a few days for them to stop looking at the camera. After that, I kind of disappeared. CA) It’s interesting because it’s marketed as “based on the music of Voice of Addiction” and you use the band’s songs throughout to push the narrative along, but it is an unscripted look at the band. PONTECORE) Correct. When you put the songs up against what is going on in the film, they seemed to have dual meanings. I didn’t set out for that, but it just worked out that way. CA) Was that something you did after the filming, after seeing whatever happened? PONTECORE) I was given that idea by someone I know. I had initially gone against that because it seemed like a sissy way to go, but once I did it I realized how much more intense it is, to see the lyrics on screen and read them. CA) Have the guys in the band seen the film yet? PONTECORE) No, they have not. I’ve sent it to them but I don’t think they have watched it. They are fairly nervous. CA) Your company is Madness Maker Films. Is this the first movie you’ve done? PONTECORE) Yes, it’s the first feature. I’ve done a few music videos but this is the first piece of sellable work that we’ve done. CA) What do you think the band will think about it? PONTECORE) I think that maybe some people will have problems with it, maybe some won’t. I think from the beginning, and I reminded them throughout, that whatever they say can and will be used against them. [Laughter] I didn’t set out to make anyone different. If someone doesn’t like the way they are portrayed maybe it’s because they didn’t like the way they acted. CA) While you were filming did they ever tell you to turn off the camera? PONTECORE) No, but I decided against filming any hard drug use because it was in people’s houses and were all scared with the cameras in the first place. But there wasn’t much of that going on and it wasn’t worth putting that into the story. CA) It comes out July 13. What happens then, will there be a premiere? PONTECORE) On July 13, I’ll probably have a heart attack. Some people will be having viewing parties and it will be on Vimeo starting then. We also will show it August 17 at Beat Kitchen, before Voice of Addiction plays. Punk Band will be released July 13. For more information, click here.